I absolutely love summer and all it has to offer like vacation (oh yeah!!!!! ), hanging out more with friends and family, and of course eating delicious food. During this time of year, I love cooking and preparing meals that are not only bursting with flavor but are fresh, colorful, vibrant, and on the lighter side. As I casually strolled into my kitchen with one eyebrow raised, I couldn’t decide on lunch. I wasn’t too hungry so something light would be perfect. Well, I encountered a problem. I didn’t plan on going to the grocery store. I had already gone a few days prior and was not in the mood to go today. Well, that immediately limited my choices and actually that was okay. Since I was dead-set on not going to the grocery store, I was forced to use what I already had in my fridge and pantry. I also had to consider the fact that I wanted to prepare something quick and easy. I looked in my freezer and saw I had shrimp. 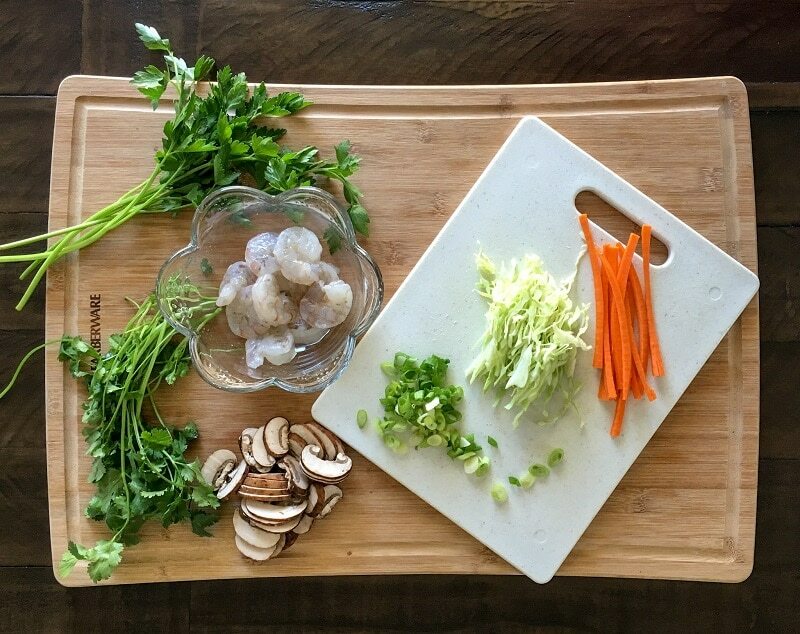 You can do so much with shrimp, so I decided to go for ‘Easy Spring Rolls’ – score. I had cabbage, mushrooms, green onion, parsley, cilantro, and carrots in the fridge. 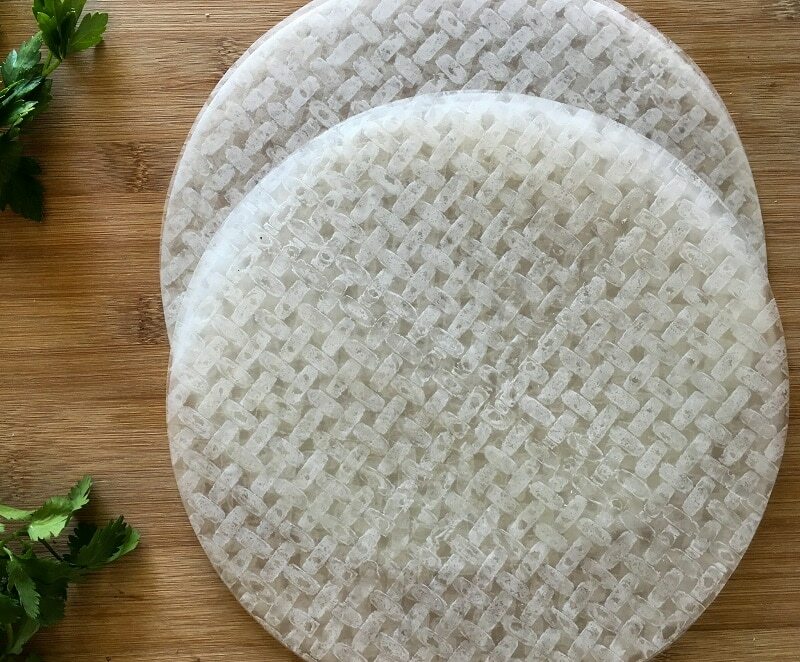 Although rice paper is not a staple in my pantry, I had a few left from a previous occasion. This was the perfect light lunch for a beautiful summer day. The fact that these easy spring rolls are homemade, quick and easy – oh yeah double score. Since there’s not much too putting these easy spring rolls together, I would recommend that you have all your veggies sliced (julienned-style) and ready to go. This will make a smooth and easy assembly line. You can also slice your shrimp in half which is what I did. This will allow you to create a really nice and delicate spring roll. For an extra crunch, you can add rice noodles. Although the rice paper wrappers are thin and delicate, you should not feel intimidated. Simply, follow the directions closely on the packaging, and you’ll be amazed as to how easy they are to wrap. Practice makes perfect so don’t get discouraged if your roll looks a little awkward the first couple of times. As you get into a rhythm, each spring roll will become easier and easier. I suggest not putting too many ingredients in one roll. This will make it more difficult to wrap. I used the surface of a regular sized dinner plate. I probably would not suggest a wooden cutting board because the rice paper might stick. A plastic or ceramic cutting board may work well. I haven’t tried either as of yet, but I plan on testing both types of surfaces in the very near future. 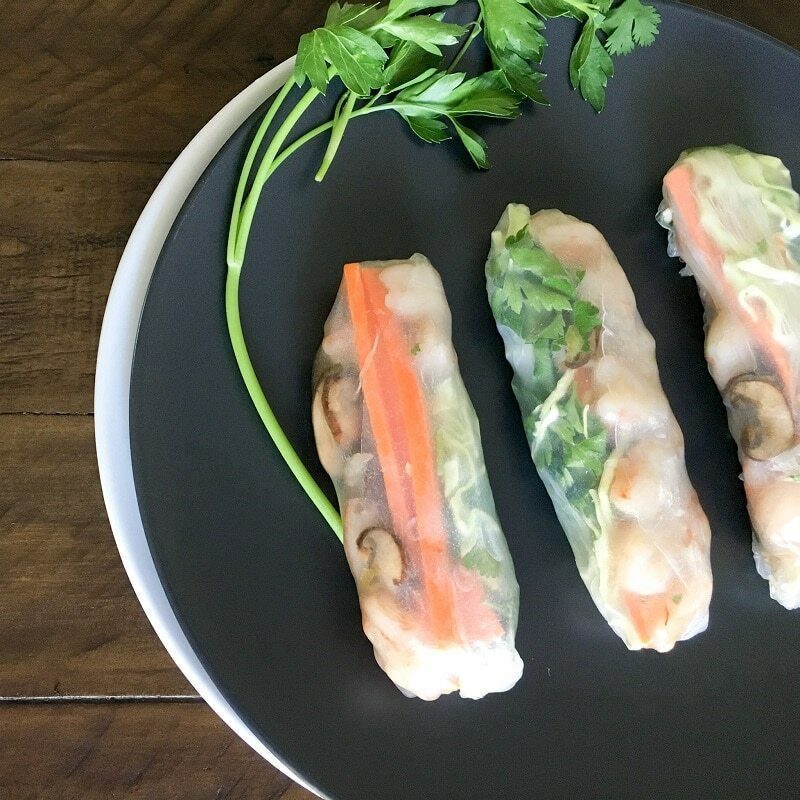 This easy spring roll recipe is amazing because it’s versatile, serves as a light lunch or dinner, and makes the most adorable appetizer. I couldn’t wait to share this simple and healthy recipe. It’s budget-friendly and can go quite a long way. Please continue reading below for this super easy spring roll recipe. Let me know your thoughts. 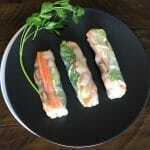 These Easy Spring Rolls are easy to make and very versatile. Fill each with your favorite veggies or meat and serve as a light lunch or appetizers to your family and friends. Make sure all your veggies are cut accordingly and if you are using a protein such as shrimp or chicken make sure it's cooked to your liking. (Note: I sauteed my shrimp and mushrooms). Make sure you understand the instructions for preparing the rice paper wrappers. Place olive oil in a small pan over medium heat. When olive oil is hot, add garlic, mushrooms, and a dash of salt to the pan and saute for about 30 seconds. 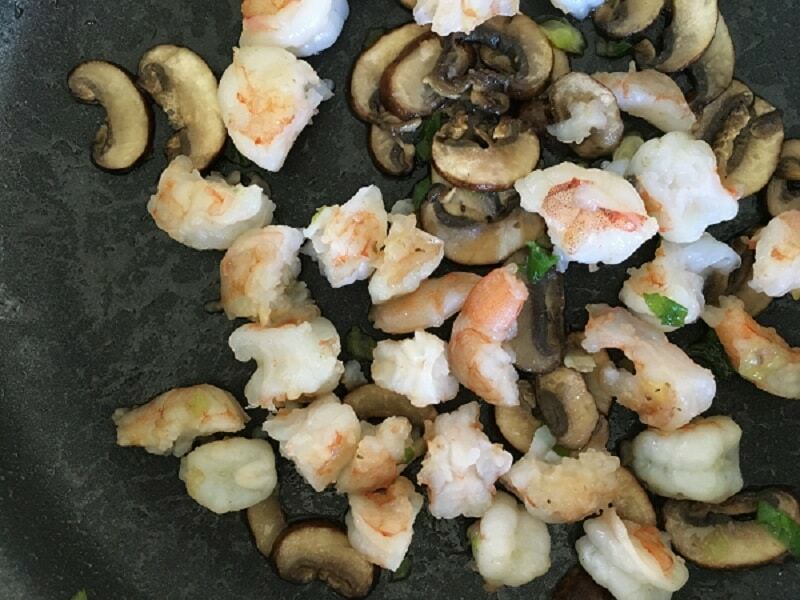 Cut your shrimp in half and set aside (Note: you can cut your shrimp in half before cooking if you like). Arrange your prepped ingredients in an assembly line. Prepare your first rice paper wrapper on your preferred surface, layer with a small amount of veggies, a bit of the saute shrimp/mushroom combination, chopped parsley and cilantro, and carefully roll tightly (almost like a burrito). You can also tuck in the sides of the wrapper if you like. Serve with your favorite dipping sauce such a peanut sauce or chimichurri. The time to complete may vary depending on how many people you are serving. This Easy Spring Roll recipe is versatile. You can add all sorts of vegetables such as colorful bell peppers, cucumbers as well as different types of herbs. It's all about experimentally with ingredients that you and your family love.